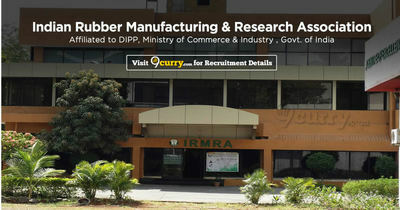 IRMRA Recruitment 2019: Indian Rubber Manufacturers Research Association / irmra.org is conducting recruitment processes to fill 1 vacancy. As of now, there is one recruitment drive going on for JRF Post. IRMRA Recruitment 2019 - Job notification for JRF Post in IRMRA, Thane, Maharashtra. Applications are invited by Indian Rubber Manufacturers Research Association on or before 22 Apr 2019 for 1 vacancy. IRMRA Recruitment 2019 - Job notification for Accounts Assistant Post in IRMRA, Thane, Maharashtra on Contract Basis. Applications are invited by Indian Rubber Manufacturers Research Association on or before 28 Mar 2019 for 1 vacancy.